For most of the twentieth century, considered opinion in the United States regarding Palestine has favored the inherent right of Jews to exist in the Holy Land. That Palestinians, as a native population, could claim the same right has been largely ignored. 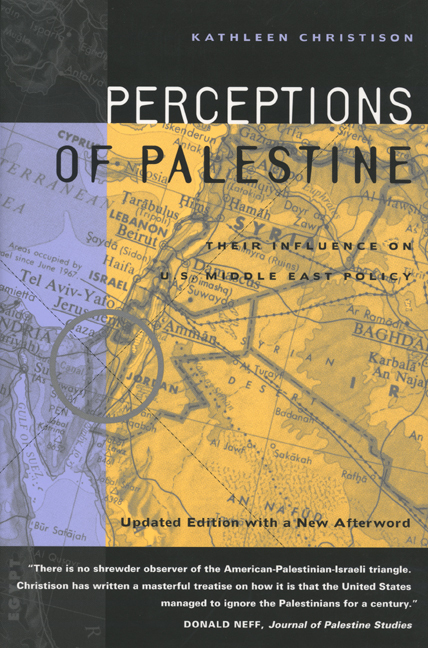 Kathleen Christison's controversial new book shows how the endurance of such assumptions, along with America's singular focus on Israel and general ignorance of the Palestinian point of view, has impeded a resolution to the Arab-Israeli conflict. Christison begins with the derogatory images of Arabs purveyed by Western travelers to the Middle East in the nineteenth century, including Mark Twain, who wrote that Palestine's inhabitants were "abject beggars by nature, instinct, and education." She demonstrates other elements that have influenced U.S. policymakers: American religious attitudes toward the Holy Land that legitimize the Jewish presence; sympathy for Jews derived from the Holocaust; a sense of cultural identity wherein Israelis are "like us" and Arabs distant aliens. She makes a forceful case that decades of negative portrayals of Palestinians have distorted U.S. policy, making it virtually impossible to promote resolutions based on equality and reciprocity between Palestinians and Israelis. Christison also challenges prevalent media images and emphasizes the importance of terminology: Two examples are the designation of who is a "terrorist" and the imposition of place names (which can pass judgment on ownership). 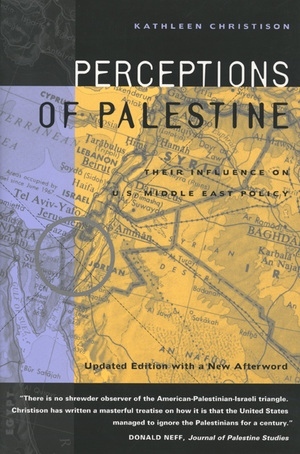 Christison's thoughtful book raises a final disturbing question: If a broader frame of reference on the Palestinian-Israeli conflict had been employed, allowing a less warped public discourse, might not years of warfare have been avoided and steps toward peace achieved much earlier? Kathleen Christison, a freelance writer and former CIA analyst, has written on Middle East affairs for over twenty-five years. She lives in Santa Fe, New Mexico.